The only one recipe which is loved by all ages - Biryani. My Kids started liking it too early, by 18 months itself both like biryani/pulao than the paruppu sadham or other less spicy foods :)So for them i make biryani lil' mushy and soft. But now they are little grown up boys and their likes n dislikes changed. The only happy thing is still they like biryani/pulao with rice grains separate no need of mushy biryani. Of all the biryanis Chicken Biryani is our Family Favorite n used to make monthly once or once in two months. Every time i used to try new recipes, last time tried Andhra Chicken Pulao and this time tried this chicken biryani from Spice india online site. Have tried this few times earlier but this time only got time to click few pics. This biryani is Easy & simple Chicken Biryani with less spices and low calorie version using Yogurt/Curd. So if your looking for low calorie version with great taste try this chicken biryani, so delicious and aromatic. Now off to the recipe..
First wash chicken drain excess water then marinate with the ingredients given under the heading "To marinate" and cover it and keep aside for at least 30 minutes. Wash and soak rice in water for atleast 20-30 minutes. Heat oil in a skillet/pressure cooker, add the tempering ingredients one by one then add onion, green chilli, mint leaves, cilantro sprinkle little salt and saute for 1-2 minutes. Then add ginger garlic paste and saute till the raw smell leaves. After that add tomato and saute till it turns soft n mushy. Now add the marinated chicken, chilli powder, turmeric powder and saute for 2-3 minutes. Then cook covered for 6-7 minutes or till the chicken gets 3/4th cooked. And then add enough 1 cup yogurt and 2 or 3 cups of water, enough salt and allow to boil. Once it starts boiling, reduce the flame and cook for 3 minutes. And now add soaked and drained rice and pressure cook for 1 -2 whistles. But if u are cooking in skillet/stove top, cook rice with lid closed in medium heat till 80% water absorbed(see pic below). At this stage using a clean kitchen towel close the skillet and then close the cloth with lid and turn the heat to low and cook in DUM for 6-7 minutes. That's it..Yummy & Aromatic Chicken Biryani ready. Serve hot with raita/curry/boiled eggs. Use fresh yogurt, sour yogurt/curd will make ur biryani sour n tasteless. Adjust spices to your taste, the above will yield u medium spicy biryani. Such a flavourful and inviting briyani Sangee, love those prefectly cooked rice grains..Droolworthy,low fat briyani is just inviting. We are Biryani fans, Sangee.. This version looks so easy to make, yet flavorful.. Love that the rice are separate and fluffy..Perfect one pot meal for sunday afternoon.. I like the way u chopped the chicken pieces, nice biriyani with beautiful clicks. Delicious and mouthwatering chicken biriyani. Wonderfully prepared. Wow!! this is such drool worthy Biriyani.. loved the color very much..
i always prefer the easy version :) quick to make and no tension required..
i can see it is packed with flavors. love chicken biriyani any time. I tried Cooking this, and believe me, it's healthy and way more testy than i thought. Thanks for trying my recipe and thanks for ur lovely feedback too. thanks for your lovely feedback, means a lot to me. keep trying and sharing your valuable suggestions & feedback. Thanks again! once the water drained n rice cooked the warm button will turn on automatically. Hope this helps. Tried and tested. Fantastic flavour. Thanks for trying and sharing your feedback. Thanks for sharing your feedback, glad you liked it ! Thanks a lot. It was really superb. Tried it. Was superb and simple as well. Thanks a lot. Keep going. Thanks a ton for taking time to share your feedback. Thanks again! Thank you so much for your lovely feedback, glad that my recipe motivated n helped you to cook chicken :) thanks again, happy cooking ! the last 2 steps are not clear plz exxplain since i dnt know how to cook. where to boil rice? in the same biryani masala skillet? Yes.,you have to add the rice to the boiling biryani masala and cook till the rice done if u r cooking in a pan like me. You can also use pressure cooker for the entire process and cook for 1or 2 whistles. Or you can use Electri Rice Cooker, saute everything in the pan and transfer the entire content, water n rice to the cooker vessel n turn on till done. Hope this helps! Whats the measure of your cup? i need to know how many grams of rice to be used for 1 lb of chicken. For 1 lb Chicken you can use 500 grams rice. thnks for the recipe..planning to try it out in comig 2-3 days. I will be usig 800 gms chicken.plz tell me the quantity of spices to be used for marination and the amout of rice. You can increase 1/4-1/2 tsp of all the ingredients(for marination) and you can use 1 kg or 1 1/4 kg of rice. Hope this helps! If you try this recipe, Don't forget to share your feedback . Thanks! Best recipe so far , very light & full of taste . Very nice recipe an easy one. Did today dh loved it. Thanks fr wonderful recipe. thanks so much for your kind appreciation and the feedback. Thanks so much Sindhu for trying my recipe and am glad that you got it perfectly. Thanks for your prompt feedback too..
in medium high flame till it boils and bubbles more and when the water is 80% absorbed will turn the heat to low-medium and cover the vessel with kitchen towel then close it with lid and cook for 6-7 minutes. After that open the lid,towel and gently fluff the rice with fork or slotted laddle and again close it with lid alone. If you want you can transfer the biryani to hot box or any serving bowl. Hope this helps! Hi, maybe i know what do you fresh yogurt? In my supermarket, we dont have fresh yogurt. Can I buy plain yogurt from yami or yoguru shop? I did not able to get fresh yogurt. Can I purchase plain yogurt from yogurt shop like yami or yoguru to replace fresh yogurt? Yes.you can use Plain Yogurt. Tried this recipe today. To my surprise, this is the first time a biriyani that i cooked has come out so nice. Thank you very much. Thanks for the recipe it was awesome. Easy to cook and tasty. Thanks it was awesome. Easy to cook and tasty. Thanks for the recipe,it was awesome,easy to cook and first time i have cooked the biryani me and my friends were fully satisfied. This was my 1st attempt & i succeeded & have left a grt8 impression on my husband & friends. I will surely be trying to make other items in ur site & have a quick question…can i use the same method to make veg biryani?? Yes.,the same way you can also make Vegetable biryani, Soya chunks Biryani, Mushroom Biryani, i have tried it with both veggies and chicken, both tastes great and flavorful. 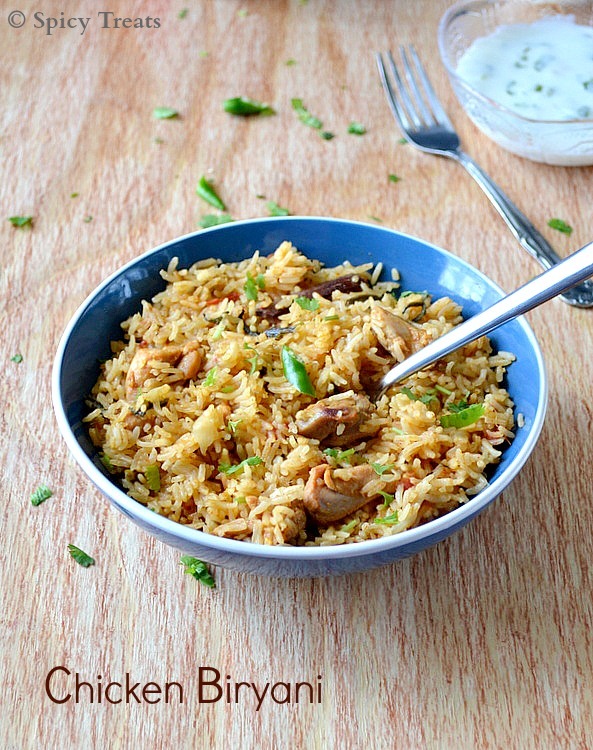 Thanks for sharing this chicken biryani recipe. It such a delicious dish that we can try on our own by just following on your recipe procedures. Also, the lovely pictures you've provided are amazing, makes the dish more mouthwatering one. :) .good job, continue to share your knowledge . .cheers! Tried it today. Came out awesome. My kid nd hubby just loved it. Thank u for a wonderful biryani recipe. hi sangeetha,,, yours is a great blog/website... today i tried your chicken biriyani..i should say this...after 20 years of married life this is the first time i am making chick biryani without my mother in law's help. it was simply great and everyone liked it. i particularly liked it because of its low fat nature by not using ghee and coconut milk. i will also try out your other recipes and post my comments with photos. Thanks again for taking time to share your feedback, means a lot ! Hi, I tried the recipe it was really good but the rice came out too soft because on the instructions it said 2 or 3 cups of water including the diluted cup of yogurt which totals to 4 cups of liquid for 2 cups of rice. Do you think i should of put 2 cups water plus 1 cup of diluted yogurt would of been good? I want to try again. Thank yo u. It depends on rice quality and age...so next time try adding 1/2 cup less water. For 2 cups of rice use 3 or 3.5 cups of liquid. Thanks so much :) Glad it turned out perfectly to you!! 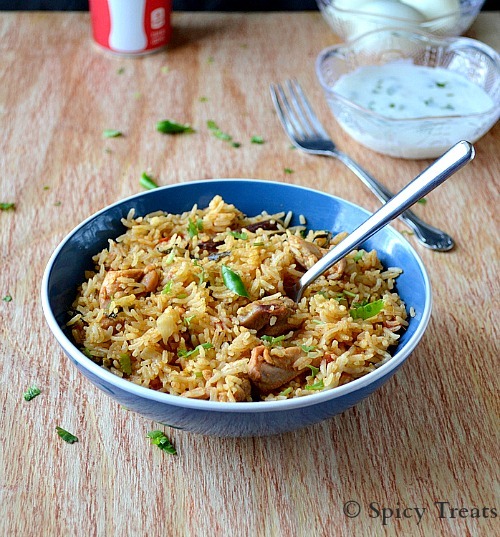 What a delightful dish thanks for this easy biryani recipe and the clicks are superb. Watch the preview. Perform Homescapes game free!